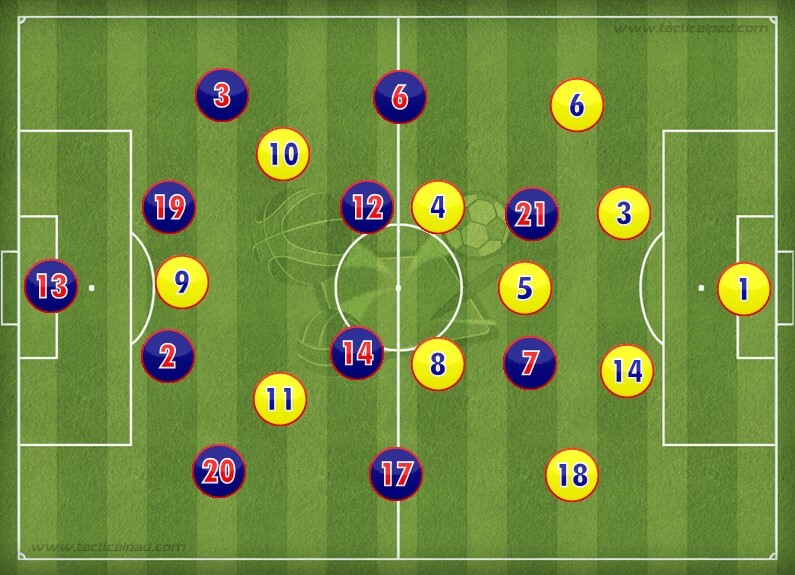 Alex Clapham writes a detailed tactical analysis about Atletico Madrid’s close win over Barcelona in the UEFA Champions League quarter final. The two teams couldn’t have come into this one in more diverse form. Somewhat surprisingly, of the two, it was Barcelona who hadn’t won a league game in their 3 previous attempts and their 11 point lead over rivals Atleti had been reduced to a mere 3 following a 1-0 defeat in San Sebastian to Real Sociedad four days prior. The hosts netted eight times in the two league fixtures leading into this game and were flying in confidence; yet the Catalan champions were clear favourites having pipped 10-man Atletico 2-1 in the first leg. 53,000 boisterous fans watched an incredibly intense encounter that saw the Barca knocked from their throne by an Antione Griezmann double. Cholo Simeone’s men eliminated Barcelona from the Champions League for the second time in 3 years; both came at the quarter final stage. Atletico played with intent from the get-go, Carrasco partnering Griezmann in a front two that went out with attempts to force the visitors to play more direct with longer passes. 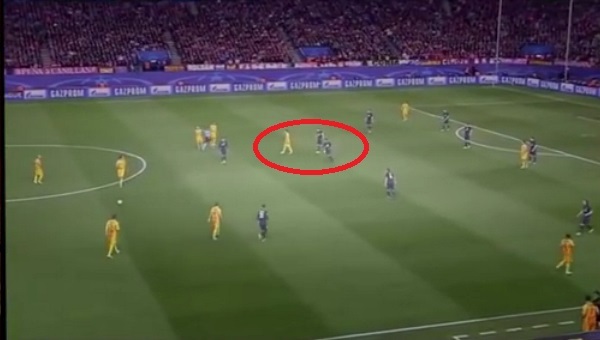 In the above image, we see ter Stegen in possession as the pass to Busquets is cut out by the strikers. 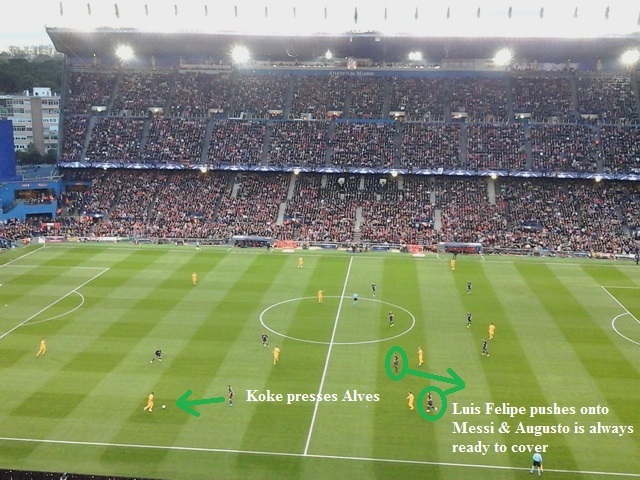 The midfield wall is set up with widemen Koke and Saul wasting no time in pressing Barcelona full backs when in possession. 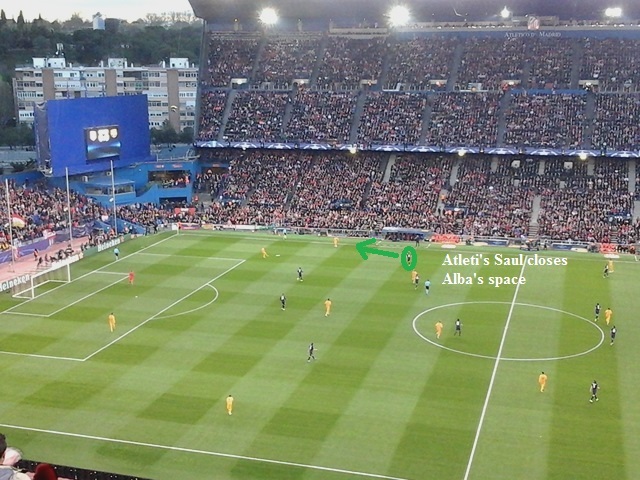 Both Alba and Alves had minimal time on the ball as Atleti restricted options to play out from the back. As the clock ticked on, Enrique knowing that Atletico needed to score, set a trap, inviting the hosts to come forward and press, opening spaces for more direct passes. 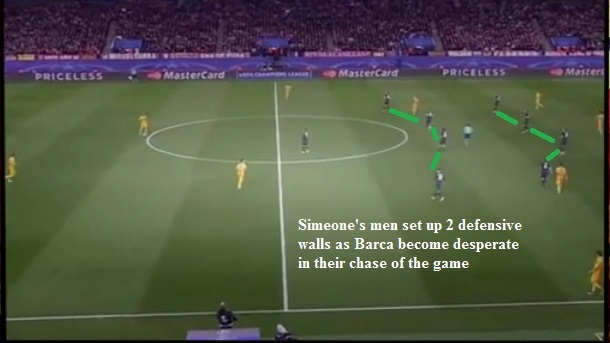 Simeone wanted to make the breakthrough before the break as a 2nd half Barca goal would leave them with a humongous task of scoring at least 2 in a short amount of time to qualify for the semi-final. The tie was resembling a game of chess as the two were waiting for each other to over-commit. 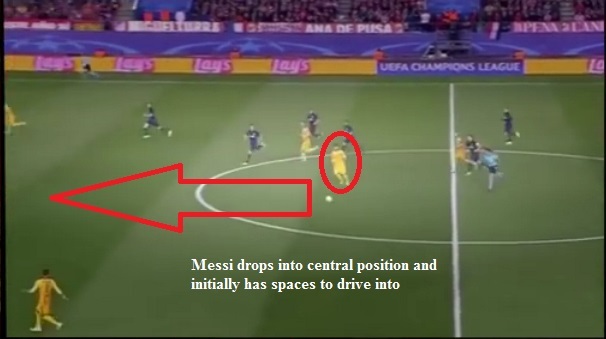 Like a boxing match, Lucho Enrique decided to switch Messi into a central position to create from deep areas. Initially the record 5-time Balon d’Or holder had success, finding himself in empty pockets of space to run at the organised defence of Cholo’s Colchoneros. 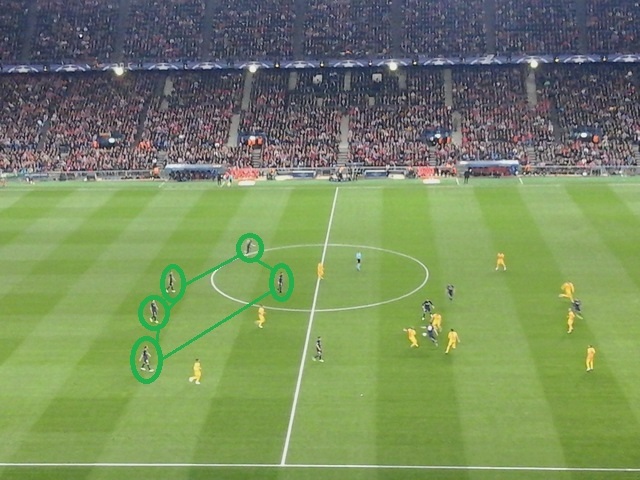 As Barca looked to get a foothold on the game, having had 72% of possession and Messi and Iniesta getting on the ball in progressive zones, Enrique fell into his own trap. Following a mazy run by the Argentine number 10, a free-kick was awarded in a dangerous area and the Catalans fled forward. The effort was fizzed over the bar and when Slovenian goalkeeper Oblak played upfield, Barca never seemed to get settled positonally. 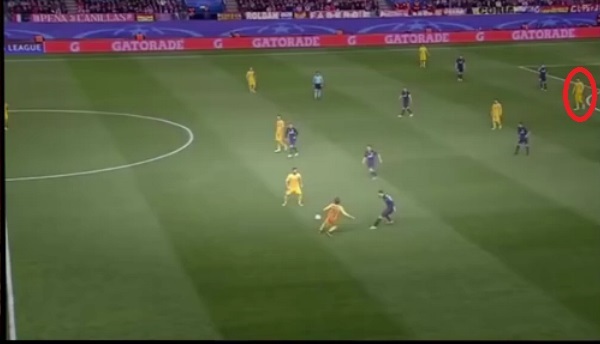 Upon a sloppy clearance by Jordi Alba, the ball was played into the path of right-winger Saul; whose sensational cross with the outside of his foot fell to an unmarked Griezmann, who duly headed home. The Frenchman has scored 20 goals this term and when Mascherano was caught napping, the 25-year old hotshot was never going to miss following the gorgeous cross that was also unchallenged by the Blaugrana players. 1 – 0 to the hosts and it was now time to do what they do best, defend. After this famous victory, Atletico Madrid have conceded a minor 26 goals in 48 games, keeping 29 clean sheets along the way. 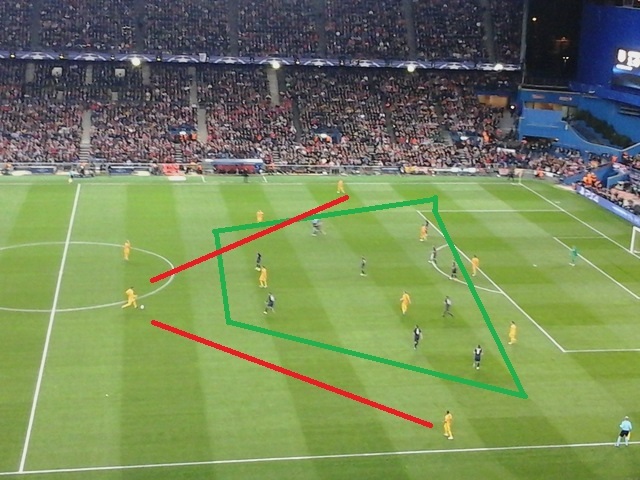 However, the scenario was identical to the one 8 days earlier in the Camp Nou, only this time Cholo’s men remained disciplined. 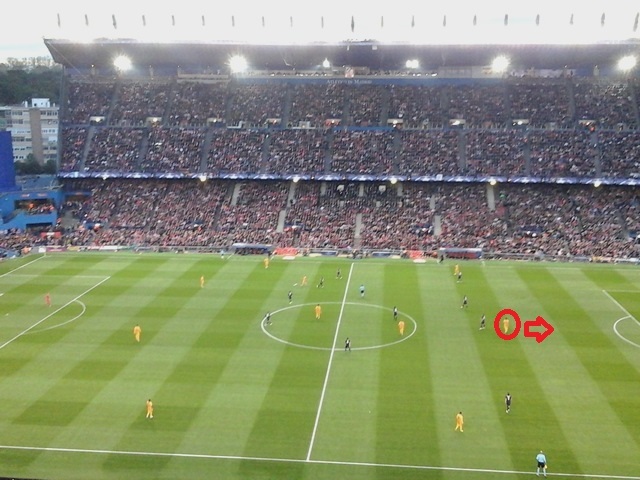 With 10 minutes until the break, the Rojiblancos pined for compactness; squeezing into central zones and defending the penalty area with Carrasco and Griezmann the first line from the front, putting a halt to Pique and Mascherano carrying the ball forwards to break the lines. 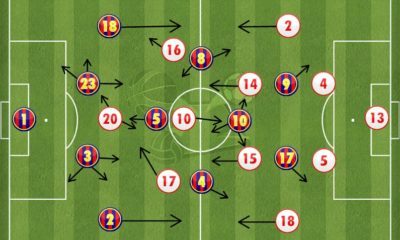 Simeone surprised many – including Barca by coming roaring out into the second period – pressing Enrique’s players and pushing both Juanfran and Filipe Luis forward to link up with Koke and Saul down the flanks. Chances arrived and ter Stegen saved smartly from Griezmann whilst a looping Saul header bounced back out off the bar, leaving the German goalkeeper stranded. As captain Gabi joined in with the pressing of Busquets – not allowing the pivot to play his usual spectacular, controlling game – Augusto was held on a defensive leash. The defensive Argentinian played out the entire second 45 minutes as part of a back-five, not giving the creative mind of Messi a second to think. 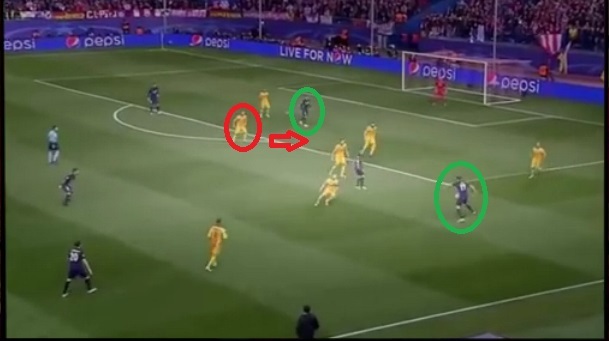 The Asturian manager of the 2014/2015 triplete winners was barking orders to his full backs to push on and as Messi dropped into his own half at times to collect the ball, spaces opened on the flanks. 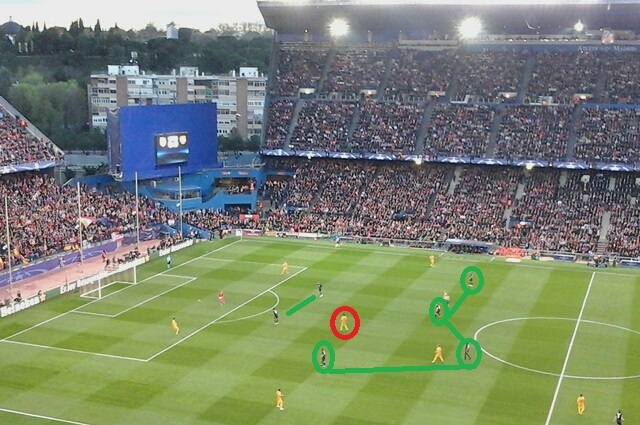 The attentions of both Saul and Koke were grabbed by Barcelona’s magician and they drifted centrally as to close gaps. With the pace of Carrasco always a threat down the left when Atletico broke, Enrique decided to switch a more agile Sergi Roberto for Brazilian Dani Alves and former Atletico de Madrid star Arda Turan also entered the frame, Ivan Rakitic making way for the Turkey National team captain. 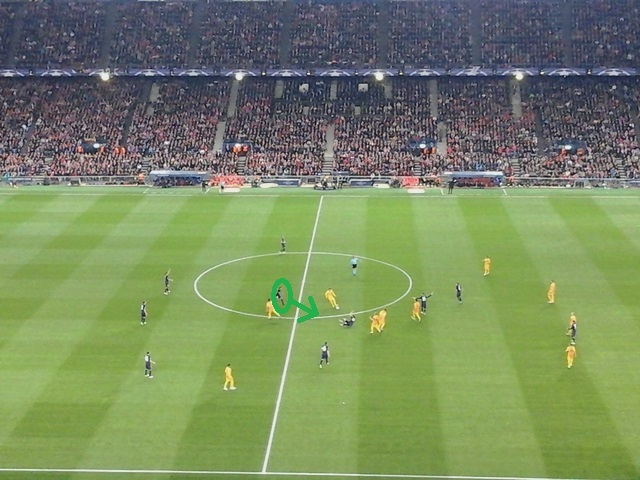 With Barca struggling to create any clear cut chances, Gerard Pique began lingering in attacking positions as to add a more physical presence in the final third; a sign of desperation from the holders as early as minute 65. 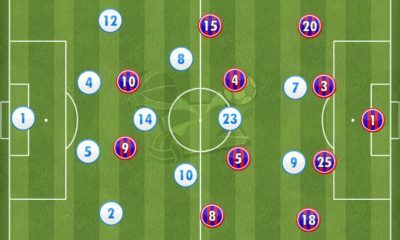 The ball circulation was laboured and slow and with Messi now being tracked by both Gabi and Augusto, Barcelona looked stagnant. 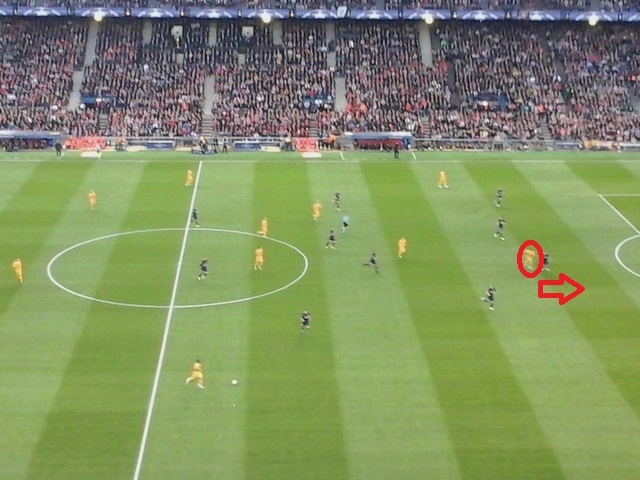 Again, Atletico were now happy to allow the visitors to play the ball into wide areas and left both Alba and Roberto in acres of space, never looking phased by any crosses into the box. By the 67th minute, Atletico had fully converted to a 4-5-1 formation as Carrasco dropped into deeper areas before being replaced by the Ghanaian Thomas in minute 74. There was no doubt about it; the Champions were out of ideas and becoming more than predictable in possession, playing straight into the hands of Atleti and the only team that looked like scoring were the hosts; and they did so, landing the ultimate sucker punch with an 87th minute counter attack. 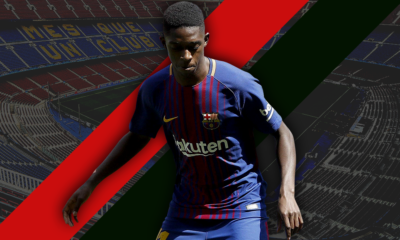 As options were few and far between for Sergio Roberto in a wide area, the 24-year old La Masia product hesitated and was dispossessed by Filipe Luis who then ran the length of the field unchallenged before having his pass blocked by the hand of a despaired, backtracking Andres Iniesta. Griezmann stepped up to convert the spot-kick, putting the icing on the cake in front of the Colchonero faithful who had the Vicente Calderon rocking by this point. A memorable evening that will go down in Atletico history as Diego Simeone is quickly becoming more than a club legend. He owns the heart of every single one of his players, staff members and fans. During his post-match interview, the Argentinian coach was quoted saying “It’s not just about football…it’s life” and he couldn’t have been more on the money as he played the conductor for the fans that danced the night away. 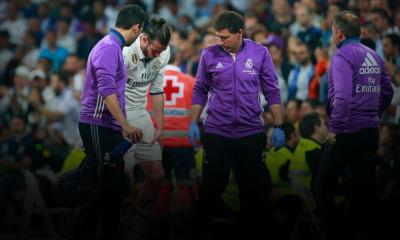 His players give everything for one-another and following a display that was extremely organised and tactically disciplined, the RojiBlancos were on their way to the semi-finals. As for Barcelona, the players have looked destroyed both mentally and physically of recent weeks and Enrique has a huge job on his hands to lift this group to go forwards for the double as they still have a league and cup to win. La Liga will go down to the wire with both Madrid teams in fine shape and Enrique’s squad must find their excellent form of the first 3 quarters of the season once more if they have any hopes of remaining in first place come May 15th.